What you’re looking at is the relative changes in gas prices, in local currency, in the US and in two Canadian cities, Edmonton and Toronto. In the periods of late-2002 through mid-2008 and again from late 2008 through today, $US gas prices in the US rose rapidly. 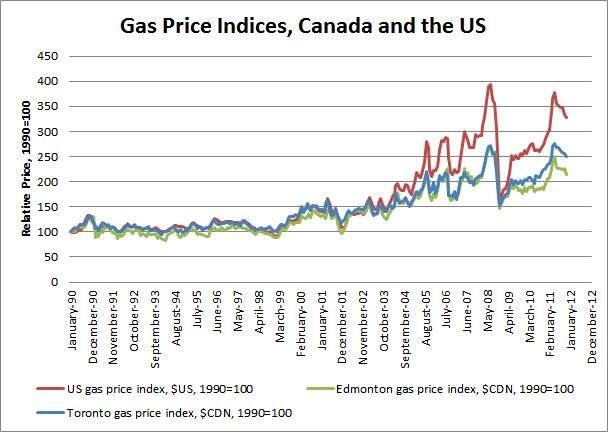 Canadian gas prices also rose in these time periods, but much less quickly. Why? Because Canadians pay for gas in Canadian dollars, while gas is traded as a global commodity. As the Canadian dollar appreciates, you can buy more gas with every dollar, all else equal. The same applies to just about anything we buy while outside of Canada as well as to goods which we import. In 2011, Canadians imported over $37 billion dollars worth of goods every month (our net imports were smaller, at about $2 billion per month). Before arguing for a devaluation of the Canadian dollar to make producers more competitive, Canadians should remember that any push to do so is a push to reduce Canadians’ real wages and to decrease our purchasing power. You might be happier paying more for gas and most everything else we buy, but I can’t imagine why you would be. So cheaper gas due to the petrodollar is good but cheaper gas due to a lower HST is bad. Higher purchasing power good. Distortions in the tax system bad. It is not just gas Robert – it would be more expensive for everything that is traded in quantity. Canadians also pay roughly twice the gas tax, on average, than Americans, which naturally damps price oscillations when measured in relative terms, as above. Have you done things graph subtracting off gasoline tax? Good points. First, I haven’t done it with taxes netted out, which will matter a great deal. I tried to get refinery rack price data to do this, which would net that out, but couldn’t find it for Canada on anything higher frequency than annual, which hides most of the variation. The PPP analysis is also important – domestic prices tend to be sticky as we see with many items such as cars – the fact that you can still buy a car much cheaper in the US than in Canada illustrates that well. With commodities, that should be less so, since they are homegenous in nature, and have fewer restrictions on resale – a Canadian gasoline distributor can buy gasoline in the US if they wish, for resale in Canada, while a Canadian Ford dealer cannot do the same. I would expect, without digging in too far, that much of the PPP effect is due to the fact that 1) prices are sticky and 2) prices of many things we consume also increase with the price of oil, due to transportation and production costs, which negates the exchange rate advantage. Thanks for pointing this out though – will think about it further. Thanks Chris. I agree that I don’t do PPP, but in this case I don’t have to since they are homogeneous commodities – gasoline is gasoline, so my argument is valid on its face. The question, raised by another commenter, of whether purchasing power of $CDN has increased as would be predicted is a very good one. It seems as though some of the costs of the goods we purchase are strongly correlated with factors which are also correlated with our dollar, but I don’t have data to back that up. If I get around to some broad data-chasing, I’ll post it, but I’ve got a long queue of work to get done so not too likely. Andrew, would you please use “gasoline” rather than “gas” when referring to the refined petroleum product. Whenever I see “gas” I think of natural gas. Maybe it’s just me (because I don’t drive much) but this usage drives me crazy. Regarding this post and yesterday’s: The dollar affects many other sectors, from tourism to forestry. The latter has seen a triple whammy: dollar, housing crash, and mountain pine beetle. Will try to differentiate between natural gas and gasoline. You are correct that many industries suffer with a higher dollar, but it’s important to remember that we import as well as export. Regarding forestry, the Alberta industry also suffers from labour shortages (especially truckers) and local inflation due to our regional petro-economy. I’d be interested in your thoughts on a “buy Canadian” policy. Yes, they do. And before that, industries with lower value products were unable to compete for labour with industries with higher net value products. I did see Stanford’s piece, and I think he’s wrong. Locking-in rent dissipation to higher-cost domestic providers is a really poor way to distribute resource rents. Interesting commments given that you’ve said before that the purchase of international offsets — from the lower cost international providers — is a bad idea. I take it then that your position is this: If an import’s purpose is oil sands extraction related, low costs matter . But if an import’s purpose is GHG mitigation related, low costs don’t matter. Welcome back. You are absolutely correct that one of the things rendered lower cost by our high dollar would be outsourced emissions reductions. However, the degree to which purchases of offsets internationally equate to emissions reductions remains a question. My issue has generally been not with the purchase of offsets per se, but the purchase of hot air credits, which you have interpreted to mean offsets of all sorts. I have no problem with the purchase of verifiable offsets, and the fact that these would be rendered cheaper by a high Canadian dollar makes them more attractive. However, if international offsets/credits/permits/etc. remain cheaper not because of comparatively lower costs of reduction but because of the availability of credits not tied to reductions, then I still don’t see why we would do so.